Southeast Asia’s ecommerce sector may not yet get as much attention as China. But as recent ecommerce estimates suggest, online B2C spending Southeast Asia is set to grow by double digits through at least 2020, making the region a key area of interest for retailers and marketers. For now, much of the ecommerce activity and web traffic in Southeast Asia is dominated by one large ecommerce retailer—Lazada Group. In fact, Lazada’s control of the region’s ecommerce sector was enough to entice Alibaba as a suitor; the China-based ecommerce giant purchased a controlling stake in the company last year for $ 1 billion. According to data from SimilarWeb cited by ecommerceIQ, Lazada properties drew the largest number of page views among B2C retail sites in Thailand, Indonesia, Singapore, Malaysia and Vietnam in December 2016. 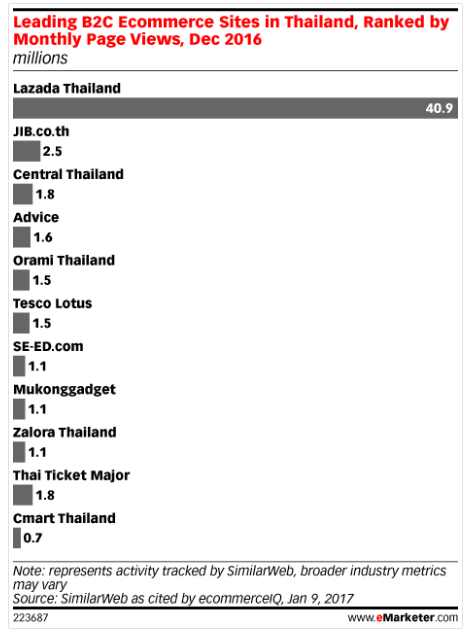 Take, for example, SimilarWeb’s figures for Thailand, where Lazada claimed almost 41 million monthly page views during the month. That was more than 16 times the number garnered by JIB.co.th, the second-place finisher. Ecommerce has yet to really catch fire in markets like Thailand, where eMarketer estimates retail ecommerce sales will make up just 1.7% of total retail sales this year. But companies like Lazada are betting that growth in internet use will create a new class of consumers looking to make digital purchases. eMarketer projects that retail ecommerce sales in Thailand will hit $ 5.7 billion by 2020. However, Lazada’s long-term success in the region is far from assured. US ecommerce heavyweight Amazon has reportedly been eyeing a launch in Southeast Asia with Singapore sometime in Q1 2017. The moves could kick off a heated battle between Amazon and Alibaba’s proxy for both market share and customers as the region’s ecommerce spending expands.